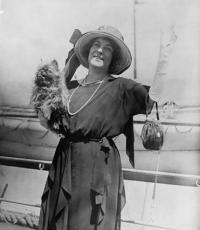 FRANCES ALDA was a New Zealand-born, Australian-raised operatic soprano. She achieved fame during the first three decades of the 20th century due to her outstanding singing voice, fine technique and colourful personality, as well as her frequent onstage partnerships at the New York Metropolitan Opera with Enrico Caruso. Wikipedia contributors. "Frances Alda." Wikipedia, The Free Encyclopedia. Wikipedia, The Free Encyclopedia, 19 Oct. 2016. Web. 14 Feb. 2017.